Not the "God is great/God is good/Let us thank Him/For our food" blessing kids use before they eat. I'm talking about speaking truth and affirmation into people's lives. Recently, I've learned--I mean, really learned--how truly power-full, empowering, and in-courage-ing a tool we have at our disposal when we choose to affirm and reinforce the good in the people we serve and lead. Every, single person with a pulse carries influence. A few intentionally use it constructively, which is why they typically stand out so prominently. They're rare. Affirming the character and heart of people we influence increases our influence and their capacities. 1. Use it sparingly. If you constantly try to affirm just whatever comes to mind, you'll cheapen the significance of those times when it really means something. 2. Distinguish between blessing and kindness. Everyone should be kind all the time. Even in criticism. But a blessing, an intentional affirmation, should be strategically placed in the life of the receiver by the giver. 3. Be specific. When giving a blessing, reference specific behaviors that represent the character worth blessing. Whether in the marketplace, your church, or your home, try giving a blessing to someone this week and watch them rise to the level and expectation of that blessing. Post a comment below and share how well-placed words of affirmation/blessing made a difference in your life. The week of June 22, 2009 will long be remembered as one of the strangest on record. First, the Governor of South Carolina revealed a multi-year affair in Argentina. Before the ink was even dry on that story, word came down that 70s icon Farrah Fawcett had lost her 3-year battle with cancer. Then, news of the death of Michael Jackson pushed the Farrah story aside. As I processed each of these stories, a common thread started to reveal itself: The necessity of community. Sanford's extramarital affair likely doomed his 2012 presidential aspirations. But, it was born in secrecy, deception, and hiding. Farrah's entire career after "the poster" and Charlie's Angels was a search for significance beyond beauty and body (if you haven't seen Robert Duval's The Apostle, you should; Farrah's talent and abilities beyond her appearance are on full display.) And, Michael Jackson's life began its bizarre unraveling when he chose to isolate himself and remove all reason and accountability. Univsersal transparency is not the answer. Universal authenticity is. It's in our best interest as people to be authentic with everyone and transparent with a precious few. "The world" does not always have our best interests and development at heart, so to bare our souls (even on Facebook or Twitter!) is unwise to say nothing of somewhat narcissistic. But that is why real community, true accountability, is in our own best interest. It keeps us honest. It tells us the truth even when it's what we need to hear and not what we want to hear. It's real. It works. Last week's VBS absolutely rocked the face off of just about anything I've ever seen. 1,200+ kids...400+ volunteer leaders...the worship...the fun...the Bible teaching...It was just amazing. 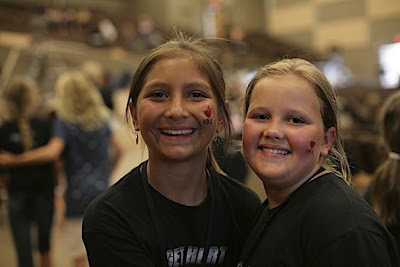 The genius of VBS is the Inside/Out dynamic that it fulfills: It gives those who are IN the LHC family a unique opportunity to serve, connect and grow as we plan, pray, and prepare to serve so many kids. The hours, the sweat, the exhaustion, the joy of seeing kids discover the love of God and what it can mean in their lives--all of it unites us around a common dream and vision. But, then there are those kids and families who've never darkened the doors of a Sunday morning service at LHC that we get to meet, engage, and introduce to Christ and his Bride. There is the offering that kids bring every morning to serve overseas and across-borders missions and orphanages. This kind of mobilization to serve those who are OUTside the family of faith is a thing of beauty to behold. I got to be there early before any of the kids and before most of the volunteers arrived, and I saw men and women, high school and middle school students show up at 7:30 a.m. in the middle of the summer, smiling, laughing, serving. And that was the big take-home for me: The undeniable link between joy/happiness and serving. The most joyful people I've ever known are those people who serve as a regular lifestyle. That link was on high definition display last week. To all of you who served and laughed and worked and sweat it out through the heat: THANK YOU. You are Lake Hills Church and I'm so grateful to you for pouring yourself into the lives of those kids. And me. It was a blessing and a gift to get to be there with you. Last night, we had the opportunity to sit down for a taped interview with UT quarterback and Heismann candidate Colt McCoy and his dad. It is salty. It's one of the strongest statements of faith that we've ever shared at Lake Hills Church. We're going to show it this weekend in our Father's Day services as we conclude the message series Manhunt. Most people I know really wrestle w/ Father's Day. It starts with, What are we gonna give Dad for Father's Day this year? Dads are tough to buy for. Always have been, always will be. Kindof like men and women are different, it just is what it is. So, go beyond the gift this year. Let me tell you the one-size-fits-all, slam-dunk, he'll-actually-use-it gift that works every time for every dad: Affirmation. Every dad worth his salt wants to know that he's doing a good job. That he's appreciated. Respected. Take the time--no, MAKE the time--to tell him something that you know is built into your life that helps you live better, more faithfully, more consistently, joyfully, or stronger than if he hadn't given it to you. Think about the little things that aren't little when they're added up over the years. We're going to help you do that. This weekend's service will affirm, IN-courage, and challenge dads for the amazing ride that is fatherhood. The rest is up to you. 4. Humility/Servanthood. For God so loved the world means EVERYBODY. Which means I'm special to Him but not any moreso than anyone else. 5. Hope. Because He rose from the dead his promised return holds a lot of water for us. So we approach each day, situation, challenge, and struggle with a sense of reality-based hope. 6. Leadership (love & good deeds, Heb. 10:24). John Maxwell's right: EVERYTHING rises and falls on leadership. And leadership HAS to include love AND good deeds, community AND accountability. See this post from way back. 7. Contentment/Stewardship. Any hangup about money is a heart issue--whether you want it too badly or you're put off by it and think it's unspiritual to have a lot. And ministry requires money and the allocating of it. So get your stuff together where this concerned if you want to do ministry. 8. Loyalty. It begins with loyalty to Christ and extends to each other. What we do is difficult if everyone is rowing in the same direction. We MUST be loyal to each other. This is a non-negotiable, and we mutually engage in a zero-tolerance environment for violation of this one. It doesn't mean we always agree--BELIEVE ME. But it means when we leave the room together, we leave the room TOGETHER. 10. Excellence/Authenticity. God doesn't do a half-way job. Neither should we. But we can't let our call to excellence be an excuse for perfectionism. Perfect love drives out fear. We plan and work and strategize a lot--which gives us enormous freedom to improvise when God leads us to. By the same token, authenticity can't be a smokescreen for laziness. Which it often is. 11. Proactivity. We agree that we're going to be figure-it-out, make-it-happen people. In a recent meeting, the LHC Leadership Team was discussing hiring and hiring practices when I made the following statement: Whatever the skills may be, make SURE he/she fits in our culture. (Really insightful, I know.) At that, one of our long-time leaders and pastors asked, "What is our culture?" I thought--privately--Are you kidding me??!! You've been here for 10 of our 12 years of existence and you're asking What is our culture??!!!! Thankfully, I didn't respond verbally with as many !'s. His point was that we had never articulated and stipulated what specific values comprise our culture. 1. Gospel. Period. Everything we are and do is tied to the fact that God so loved the world that He gave his only Son so that whosoever believes in Him will never die but will have eternal life. 2. Evangelism/Worship. We are radically committed to sharing Christ and worshiping Him because of #1. 3. Joy. May be the most obvious initial invitation to relationship with God. You can't overstate the power of joy. The Culture Conversation is actually a fun, encouraging, affirming, challenging, and convicting one to have. Have you stated the culture/values of your family/church/business/organization/team/non-profit/school/government agency?